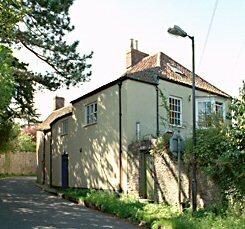 Thornbury Cottage lies on the corner of Castle Street and Kington Lane as it leaves Thornbury. The line of the cottage walls follows the Kington Lane very closely indeed and it presents a blank face to the world. From other angles the house is much more attractive and very interesting(see the photograph further down the page). Its history seems closely linked with Thornbury House. It has some unusual features, including what appears to be a very large ice-house in its grounds. We do not know whether it was a food store for the residents of Thornbury Cottage or those of Thornbury House. The property, now owned by The Hatch Camphill Community, still has substantial grounds. These include an old walled garden and it has another large area of vegetable gardens as well as attractive lawns and flower gardens. The photograph on the right is a thumbnail image showing the walled garden. Please click on it for a larger image. The Camphill Community also own what was Thornbury Grammar School and became The Hatch. These properties can be seen as they were on the 1840 Tithe Map below on the left (click on it for a larger image). Thornbury Cottage was once part of the property owned by Kingsmill Grove, who also owned and lived in the bigger house, Thornbury House which was demolished in the 1970’s. Below we have tried to list the owners of Thornbury Cottage. Click here to read about the people who appear to have lived there. In the very early Borough records it is difficult to determine which rents and taxes relate to houses and which relate only to closes of land. This may be land which lies along Kington Lane adjacent to Thornbury Cottage. However we cannot be sure whether it would necessarily include a messuage or dwelling at that time. The earliest documents that we have seen which refer specifically to a cottage on this site are held amongst the deeds of Vine Cottage in Kington Lane. Those deeds make it clear that in December 1737 the property was owned by Henry Weare and then by his widow Ann who died in 1737. In 1737 George Weir a grocer and their younger son went to the Manor Court to formally become the rightful owner. In April 1754 the will of George Weare of the City of Bristol, gentleman left his customary estate in Thornbury to his eldest son, Henry Weare. George Weare’s estate included land in Doynton as well as his “customary tenement lands and estate” in Thornbury, which were said to be in possession of Elizabeth Stokes or her under-tenants. His other sons, George and William Weare, were left George’s property in St Thomas in Bristol. His daughters Penelope and Susannah Weare received thirteen hundred pounds each. John Barkenridge (or Braikenridge) of Brislington, his son in law, was given £800. Another son in law Thomas Parsons was given seventy guineas and the residue of the estate. We know that this property seemed to be valued at a Land Tax rate of 7/- and so it seems possible that as early as 1727 Mr Weare was the owner of this property. In 1737 the owner of what appears to be the same property was described as “Elizabeth Weare widow.” A plaque in the United Reformed Church says that Elizabeth Weare died 7th July 1753 aged 77 years. On May 30th 1754 Henry Weare came to the Manor Court to formally register his ownership of the property in Thornbury. The messuage on the property was then described as formerly inhabited by Charles Morgan since deceased. This record also identifies the property more clearly and refers to the Closes of land of which this property comprised. These included amongst others; Home Close, Gourlands, Bickley Mead, Little Bickley Mead, Birkleys and Laky Leaze and they appear to correspond to the 1696 Tithe Terrier. The property appears to have been in the same family from the late 1600s and possibly before. The Weare family was an influential one. George Weare the younger (presumably the heir to property in St Thomas) was a Sheriff of Bristol in 1750 and Mayor in 1767, when he was described as a grocer. Henry Weare, presumably the heir to the property in Thornbury was also a Sheriff of Bristol. There also seems to be a connection with a wealthy merchant, George Braikenridge (1738 – 1827) of Virginia USA and Winash House Brislington Bristol who was in partnership with a “kinsman” called Weare as a drysalter in Temple Street Bristol in 1797. There is a memorial in Thornbury Church to Henry Weare late of the City of Bristol who departed this life 5th June 1773 aged 63 and to his wife Susanna who died on 17th January 1774 aged 45. The couple were buried near their infant daughter Mary who died aged 16 weeks and two days in January 1765. It is difficult for us to explain therefore how it is that on 7th July 1784 Henry Weare formerly of Bristol and now of Yeovil came to the Manor Court. However he surrendered one messuage or tenement now occupied by William Taylor, one barn, one garden, one orchard and also closes of land including Home Close, Gourlands, Bickley Mead, Little Bickley Mead, Birkleys Laky Leaze and others. Although the document is part of the deeds of Vine Cottage it refers to a period before that cottage was built and applies to Thornbury Cottage and the land attached to it (including the land on which Vine Cottage was built). The person to whom Henry Weare surrendered what is now Thornbury Cottage and the then associated land was the subject of a lengthy dispute. William Pitcher claimed that having paid his five shillings he was entitled to an option on the property. Click here to read about William Pitcher. Another claimant to the property was Edward Thurston. Henry Weare eventually seems to have accepted a payment of £673 from William Osborne, a major landowner in the area who was living at Kyneton House. On October 5th 1787 William Osborne surr endered his ownership of at least part of this property to Kingsmill Grove. However it seems likely that not all the accompanying land was involved in this transaction as William Osborne was still paying Land Tax for “Weare’s” in 1810, albeit at the considerably reduced amount of 2s 4d. “the messuage late in the occupation of Mrs Sarah Jefferies and now of Charles Harrison M. D by me lately erected and built at the lower end of the said Home Close and the garden taken there from all situate and being in and near the Tything of Kington aforesaid within the Manor of Thornbury in the said County of Gloucester and are part of one part of customary land by me purchased of William Osborne gentleman (save and except the garden or part thereof on the northeast part or front of the said messuage in the occupation of the said Martha Thurston which is freehold).” We now know this to be Vine Cottage in Kington Lane. Thornbury Cottage was subsequently inherited by Sir John Key the owner of Thornbury House. From the rate books we are able to confirm that Thornbury Cottage continued to be owned by the Key family. The 1859 rate book shows that the property was owned by Sir Kingsmill Grove Key. In 1868 the property was put up for sale but it must not have been sold as it continued to be owned by Kingsmill Grove Key according to the 1876 Rate Book and it continued in his ownership until after 1899. It was sold on the 26th May 1900 with Thornbury House. The 1905 rate book shows that it was then owned by General Mundy and his wife Geraldine. By 1925 Thornbury Cottage was owned by Mrs Mundy’s heir the Hon Mrs Gillett who again also owned Thornbury House. Thornbury Cottage may be part of the Thornbury House estate which was sold off in 1948. It was subsequently acquired by the Hatch Camphill Community.